Flying in and out of The Bahamas is easy, but Odyssey Aviation makes it even easier. Our staff is fully educated on all procedures. Please do not hesitate to contact us with any questions or concerns at 242-702-0200 or Info.mynn@odysseyaviation.com. Flights operating in the Bahamas as private do not require a landing permit. Flights operating as charter will require a landing permit. People travelling with pets, fruits and veggies, and plants are required to have a permit from the Bahamas Department of Agriculture. We can assist you with any permit(s) you may need when visiting The Bahamas. We need one business day advance notice for most permits with the exception of an Annual License. We will speak to the pilot upon arrival to inform him or her of the needed documents for departure. Flight plan forms are found at the front desk and can be completed by crew prior to departure and faxed to local ATC for processing. 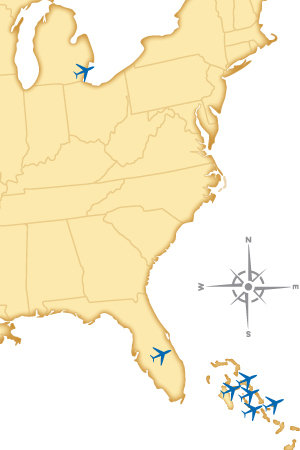 To file a Flight Plan online, visit http://www.fltplan.com. To file a Flight Plan over the phone, call 800-WXBRIEF. To file an outbound eAPIS manifest, click here: https://eapis.cbp.dhs.gov. You must enroll in the e-APIS manifest program before you can file a manifest. Pilot, crew, and airplane information are all required and the manifest must be submitted an hour prior to departure.